Government has forgotten meanings of words like DEMOCRACY, POLITENESS, CORRUPTION FREE INDIA it’s not a major concern. A major concern is that government forgot people of INDIA. 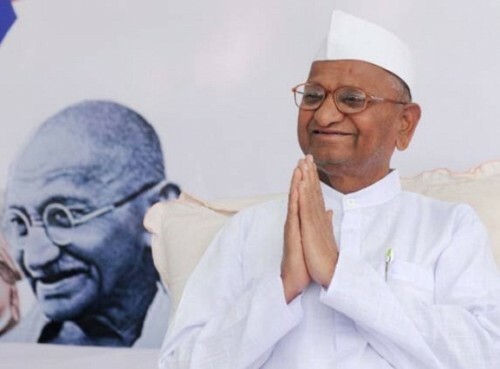 ‘ANNA HAZARE’ is GANDHIJI of modern era. GANDHIJI will born to lead India whenever India gets mislead by devils. Government is so stubborn that medicine of GHANDHI THOUGHTS is also not working. Government, Please use your power to fight with terrorists and not with nation developing people like ANNA HAZARE. If terrorist does not fear from power of ‘Government of India’ then why should youngster of India fear? Indian Democracy is not a democracy; it’s a monarchy of SONIA GHANDHI. ‘CONGRESS PARTY’ is considering ANNA HAZARE as a threat but not AJMAL AMIR KASAB. We people of democracy feel that we are living under emperor; who wants only to fill pockets with money. What is difference between India and U.S; Answer is it’s a difference between MANMOHAN SIGN and BARACK OBAMA. People of congress party say that RAJ THAKREY break peace of India. What they are doing currently aren’t they breaking peace of India? Congress party treating ANNA HAZARE and KASAB alike, both are in jail with high security. It’s not important that from how much time party is ruling India, but the important thing is how party ruled India. Government will say after few days- According law and order now onwards definition of democracy has changed it is not people who choose people for people but it will be like People who choose people for CONGRESS PARTY. Furthermore they will say; we will arrest who dare to point out finger against this definition. It is law and order. You have to accept what we decide. After freedom, in 120 crores, 50 crores guest people should leave from Bharat or India? Why is the population or pollution burden to India? On the 65 year of Independent day. They can resolve the problem in their country, they learn more from India. a Film Director can make the full coverage film on CORRUPTION., after freedom to till time. Is it really the India is a poor country or unemployment country or undevelop country or uneducated country. Hw many unmarried in India, unemployment in every age in every family members. Why name : India? it may be a name in Russian while russia is helpful or Japanisee as have honour or Australian or Africa Language or may be a Bharat itself, Whay English Name "India". PLease wait....please wait.....please wait ...India will develop...... All the matters move in the "In-4-Nation"/information as says : DELHI-KOLKATTA-CHENNAI-MUMBAI or All-in-one India. In before, there was in issue of Hindu-Muslim and now BJP-Congress. It is shameless to India. Kahin 2012 Se Pahle 12 Na Baj Jaye (regarding Nastrodasam or Maya Calender). Why Corruption in India? ?.....What is the reason? ?...Will really India be Super Power or Economic Power, How ? ?...How many field of the Corruption or Non-corruption? ?...Many time it may be possible that a General Post/Dak not goes to the Govt. Office or Cencern Department/Person. RTI is not powerful. A person's information is not goes to the right direction. After freedom, why India's all villages not developed till time. Prime Minister and President should visit all over India Cities and Villages together International Tour for public opinion, only Delhi is not enough to India. How many different team or members are involved in the Stop Corruption as non-violance or violance or parties or non-parties or normal people or poor people or terrorist person or youngesters or woman or old age or working person or non-working person. There are different view faces in the STop Corruption. Is it really a public support or as show only. In the public support, it is involve who have not "Ann"(Non-Corrupted) and who have "Ann"(Corrupted) in the Stomach and who enjoying the matter of Corruption, only while they are not serious and somebody like the matter corruption as involve in their regular life and they heart so like to support to Anna's Corruption. It is not clear support to Ann's Corruption or Corruption matter, somebody as a selfish have involvement in the corruption war.People should reach out from their Dibba "Internet-TV-Computer-Mobile-Bungalow-car-home-bike-camera". Film industries or Sports or Companies or organisations or stock market or Woman rights(corruption) should support to Ann's mission. Janta elect the parliamentary committee and janta also change the parliamentary committee, says "No Election". In todays India corruption is deep rooted right from the time you are born till you die and even thereafter. Fight against corruption would stand out and be more effective if the fight is against corruption and not against any particular political party. Please also reform the elections where a huge amount of public money is spent. Anna Hazare won the game but ...the fight against corruption lost its intent. What stunt? ask those people those who do not get justice, see how they suffer because of this corruption in India. everyone is feared to ask for justice and goondas rule those places where people can't even witness the truth. There are several people now joined Anna and it takes it's own time to strengthen it's power step by step. Everyone needs instant results without cooking. Give time, support Anna and wait for good results to comeout.